Love, Love, Love this shampoo and conditioner! 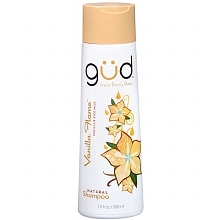 Can't say enough good about Gud's Shampoo and Conditioner in the Vanilla Flame scent. Wonderful vanilla smell that's natural and doesn't make your hair smell like a chem lab. Leaves my hair feeling super soft! The price is also great, compared to many all natural products it's very cheap...even compared to some non-natural products it's pretty inexpensive. No parabens, phthalates, or petrochemicals and no animal testing is just the icing on top of this wonderful product!